Despite Apple trademarking the name iWatch in various countries and hiring developers for what appears to be iWatch development, combined with the rumored efforts of Samsung and Google towards smart watch development, it appears that the traditional mechanical watch as seen the end of its days. 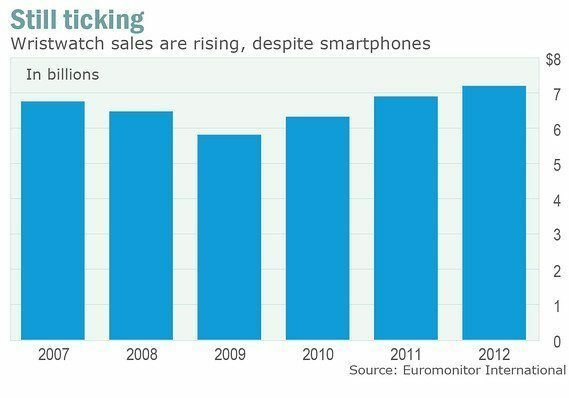 Don’t tell that to the Swiss watch industry, who saw consecutive sales slumps in 2008 and 2009, but has since turned around according to Euromonitor International. Last year, U.S. sales increased to numbers greater than loses in previous years and industry analysts expect continued growth. Analysts predict that mechanical watch industry will grow by another 30% by 2017 according to Euromonitor. According to analysts, the sales increase is supported by the luxury brands such as Rolex. High-end watches, defined by a retail value of $1000 or more, are now being sold for $2,500 on average, a retail value not seen since before the great recession. The growth surprised analysts who just a few years ago predicted the industry’s demise because of the rise of electronic timekeeping. Rather than dumping watches, consumers have consolidated whereby rather than owning multiple watches, people are investing in a single watch. According to Liz Chatelain, president of MVI Marketing, mid-market department store watches such as David Yurman, Tag Heuer, Modado and Omega have performed well because of watch ownership consolidation. Despite the trepidation, hopefully Apple’s introduction into the watch market will bring innovations in marketing and distribution that it brought to the music, phone, and computer industry. Even though Apple may introduce a device that serves the same function as a mechanical timepiece, analysts realize that mechanical watch fans see things in a mechanical wristwatch that are not in a battery powered Suunto or Casio. Nevertheless, the watch industry could probably learn a thing or two regarding interacting with its customers, something that Apple has certainly perfected.